I love creating wagons which can be filled with flowers. The wagon was created with fall leaves, straw (dyed green) and yellow daisies. It is filled with a vast bouquet of blossoms and greens including the center sunflower, delphinium, pincussion, geranium, salvia, hydrangea and maidenhair fern. The butterflies are geranium and rose petals and a piece of green leaf. The ground was covered with silver poplar leaves. The background was decorative paper. 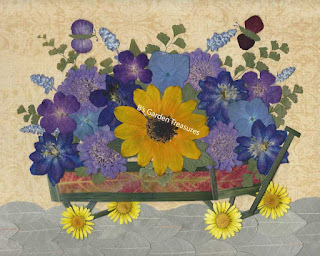 This original is 11" x 14" with the matt and frame and will look lovely on a wall with #140 - Wheelbarrow of Flowers which is still available as of 16-Nov-2012. For more information on this original pressed flower art, see my October 17th posting.